It was a great pleasure to be at the 2014 Chelsea Flower Show this year, and particularly to see the young design talent coming through and making their mark. 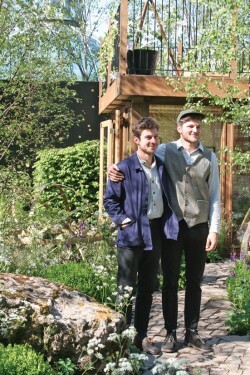 At last year’s show I had interviewed two brothers, Harry and David Rich (pictured), who had created one of the Artisan gardens. The Artisan gardens are small, around 5 x 5m, and tucked around the back of the showground in their own space – they tend to be more traditional in design and are always worth seeking out for inspiration in a small space. Harry and David’s garden had caught my eye as it was constructed using just one type of stone, from the Brecon Beacons where they live. It was a lovely garden and won them a well-deserved gold medal. This year the brothers had upgraded to Main Avenue and a show garden which is around three times that size. They had been positioned opposite the main sponsor’s garden so the pressure was definitely on. Their garden this year was called “The Night Sky Garden” and aimed to celebrate not only the landscape that the brothers grew up in but also the dark sky reserve status given to the Brecon Beacons for its outstanding quality of night sky, allowing visitors to really experience the stars. Only a handful of destinations have this reserve status as so many places are now flooded with light pollution. To then transfer this idea into a garden is quite an achievement and I really liked the genuine way this had been achieved. The garden was viewed from two sides, with a boundary of dark hornbeam hedging at the back. They had bravely used just one type of tree: silver birch, which drifted through the space to give height, texture and a light canopy overhead. A clear area of trees revealed a grass-lined stargazing pit, to lie back on and enjoy the night sky. The garden overall had a very soft, organic feel, linked through with the same stone used in their last garden in a series of curved walls, large standing stones and curved benches which partially divided the garden. The flowing theme was echoed in two dark pools, constructed for reflecting the sky and to represent black holes. The planting echoed the hard landscaping with the colours chosen to represent the Milky Way – soft whites and creams of Sweet Cicely (Myrrhis odorata), white aguilegias and Carmassia Alba, which is a tall white flower grown from a bulb. This softness was interspersed with the strong orange flowers of Verbascum petra, adding drama and fire to the night sky story. The focal point at the rear of the garden was a simple oak and glass studio with a roof space for sitting out in the dark evenings, which looked very comfortable in this natural setting. Interviewing Harry and David on the press day of the show, what struck me was how genuine this garden was. Their dad was part of the construction team – they had not sourced out the garden build to any of the big London landscape companies. The stone, oak, and paving were all sourced locally to their home and all the plants came from one nursery near where they live in Wales. They all admitted that it had been a major leap from a small tucked-away garden to a very prominent place on Main Avenue, but they had done themselves proud and won a very well-deserved silver gilt medal. I’m sure we will be seeing more of them in the future. Another young designer who caught my eye was Sophie Walker, who at 28 is the youngest female to design a garden at Chelsea. Sophie had teamed up with husband and wife growers Sue and Bleddyn Wynn Jones, and the really cool thing about them is they are modern-day plant hunters! They have a nursery at Crug Farm in North Wales where they grow on the seeds they have gathered in the wild, and sell them, having travelled all over from Jordan to Japan collecting some really exotic seed specimens. Together with Sophie they created a Fresh garden at Chelsea – this is a smaller garden but aims to show plants or materials in a new way. Sophie had put all these collected plants (Sue and Bleddyn had grown every single one from their collected seeds over the past 25 years) into a container which was viewed from a single opening and framed the plants inside. Sue told me it was very difficult to plant as they had to climb in and work backwards towards the aperture. This was the first garden in the history of Chelsea to use only wild, collected plants. The effect was magical – it made you look at these unusual plants in a new way and inspired me to want to go plant-hunting!